Proactive issue resolution, elimination of alert floods, and resource optimization, are critical IT and DevOps pain points. The EMA Top 3 products in this category were selected for their ability to create and leverage a unified operations data layer, and in some cases AI/ML capabilities, to optimally solve these challenges. AI-driven data center and hybrid cloud optimization requires code-level access to all infrastructure metrics, alerts, systems events, configuration data and compliance baselines. 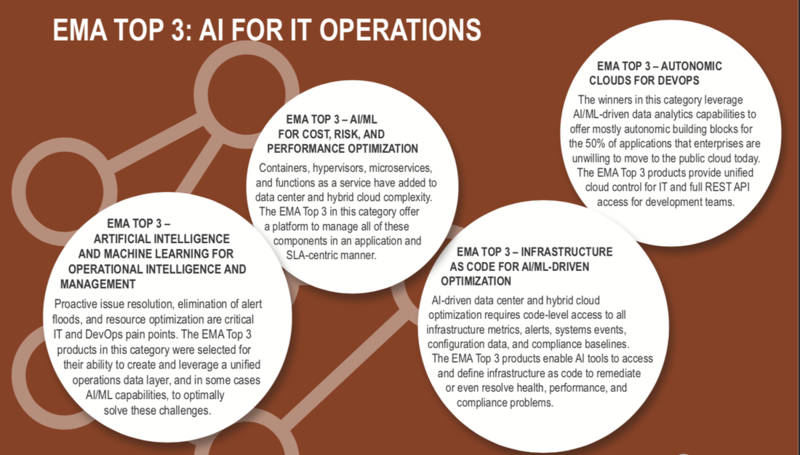 The EMA Top 3 products enable AI tools to access and define infrastructure as code to remediate or even resolve health, performance, and compliance problems. Containers, hypervisors, microservices, and functions-as-a-service have added to data center and hybrid cloud complexity. The EMA Top 3 in this category offer a platform to manage all of these components in an application and SLA-centric manner. There is a new generation of micro processors, hyper-converged systems, and platforms optimized for the massive parallel processing required by neural networks. The EMA Top 3 in this category are breaking new ground in these areas by changing the economics of AI/ML and opening up entirely new use cases. 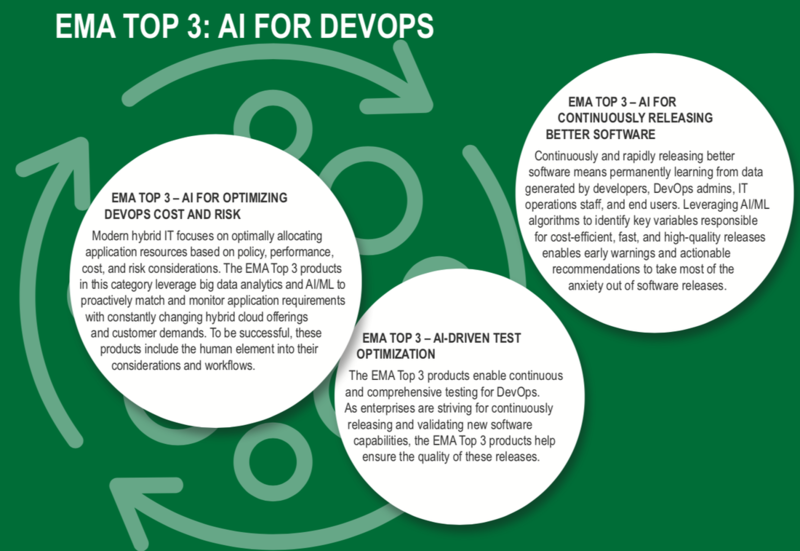 The EMA Top 3 products enable continuous and comprehensive testing for DevOps. As enterprises are striving for continuously releasing and validating new software capabilities, the EMA Top 3 products help ensure the quality of these releases. The winners in this category leverage AI/ML driven data analytics capabilities to offer mostly autonomic building blocks for the 50% of applications that enterprises are unwilling to move to the public cloud today. The EMA Top 3 products provide a unified cloud control plane for IT and full REST-API access for development teams. Modern hybrid IT focuses on optimally allocating application resources based on policy, performance, cost, and risk considerations. The EMA Top 3 products in this category leverage big data analytics and AI/ML to proactively match and monitor application requirements with constantly changing hybrid cloud offerings and customer demands. To be successful, these products include the human element into their considerations and workflows. 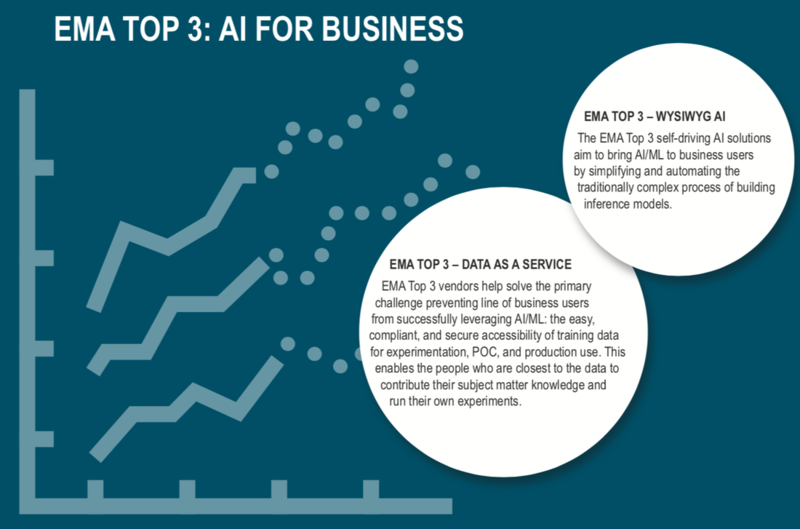 EMA Top 3 vendors help solve the number one challenge preventing line of business users from successfully leveraging AI/ML: the easy, compliant, and secure accessibility of training data for experimentation, POC, and for production use. This enables the people who are closest to the data to contribute their subject matter knowledge and run their own experiments. The EMA Top 3 self-driving AI solutions aim to bring AI/ML to business users by simplifying and automating the traditionally complex process of building inference models. The EMA Top 3 in this category bring AI/ML capabilities to edge devices that individually do not have sufficient compute, RAM, and storage resources for running inference models. AI/ML on the edge opens up new opportunities as these solutions can enable near real-time responses to distributed sensor data.